Believe that you love what you do! I am doing a big change in my life to get it all together. The 1st of November I will start working as a store Manager in a Pet Store; MaD`s Hund & Katt in Södertälje. The partners we have for the dogfood http://www.enskedehk.se/ bought the Store and will take over the 1st of November. I will also be able to do Groomings 1-2 days a week. Which feels really good. Now I have time for the puppie buyers and other people who has been contacting me before to get some help. The Grooming is held in the Pet shop which is a big and lovely store with a lot of space. I am very good at bathing and clipping all kinds of breeds. Poodles for shows. But, if you want help for the shows you have to come regularly! I cannot transform a Poodle that is not cut for months and have no shape at all. It takes weeks to get the right shape on the Poodle for a show. No matter how professional you are. I will also have seminars and trainees there during next year. I can do some hand stripping for pets, not for shows! As I have been working with dogs basically all my life and worked in England and in Sweden in Grooming shops before I have experience of doing that. During the upcoming weeks it will be more information around the Grooming and the Shop as well. I am very excited over this and it will be a new challenge in life. Can´t wait to start. There will be information on Websites and Facebook regarding Shop and Grooming. MaD`s Hund & Katt is already on Facebook and so is Vom og Hundemat and Enskede Hund & Katt. So dont forget to visit. 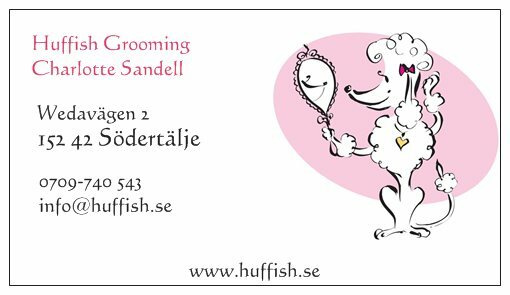 I will put up a Facebook page with Huffish Grooming just now. I really believe I love what I do best and that is dogs and animals! So this has to be good! Also thanks to Calle and Pelle for belive in me to do this, I am sure we will be a great team! You are welcome to call for appointments with your dogs already now!